Siang-Yang Tan is Professor of Psychology at Fuller Theological Seminary. 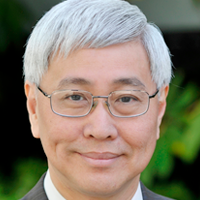 Dr. Tan is also senior pastor of First Evangelical Church Glendale in Glendale, CA. He is a distinguished researcher, writer, and scholar in Christian psychotherapy and served as president of Division 36 (Psychology of Religion) of the APA from 1998 to 1999. Of Dr. Tan’s many publications, he is best known for his book, Lay Counseling, and more recently for Full Service: Moving from Self-serve Christianity to Total Servanthood, Counseling and Psychotherapy: A Christian Perspective, and Disciplines of the Holy Spirit. He is associate editor of the Journal of Psychology and Christianity, contributing editor for the Journal of Psychology and Theology, consulting editor for Edification: Journal for the Society of Christian Psychology, and editorial consultant of the Journal of Spiritual Formation and Soul Care.